If you aren’t in to Starbucks, which I realize many aren’t, or you aren’t into twitter, tumblr, pinterest, and the like…. then maybe you haven’t seen the blitz that is the Starbucks marketing efforts to promo the Pumpkin Spice Latte. I’m only a little ashamed to admit that I’ve already had one this season, despite the numerous articles about how unhealthy it is, and the more convincing articles about how you should just drink it ’cause it’s not that serious. Through it all, I was struck by two things: 1) Goodness! Where did the summer go? 2) Starbucks has some genius marketers in their corner to be able to create this much hype over a drink that doesn’t even have pumpkin in it. Starbucks adeptly got people from point A (twitter) to point B (their local Starbucks), with the clever use of a contest, and the promise of an early taste of the coveted PSL. So maybe you’re asking – So what did they actually do? And what’s so great about all of this? And how does this apply to anyone besides Starbucks? Glad you asked! I’ll take your (my) questions in order. 1) So what did they actually do? @TheRealPSL tweeted a total of five clues over a week. Each tweet had a link to tumblr, Pinterest or other tweets, and participants played a series of games to reveal the answer to the day’s clue. Once each of the five puzzles had been solved, participants had to combine them to unlock a code word. 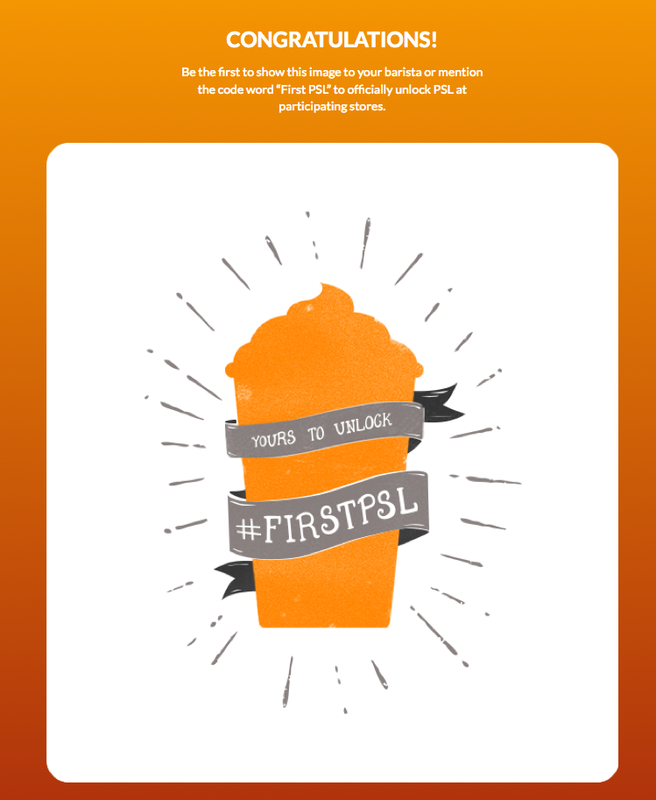 With code word in hand (or on phone, as the case may be) thirsty fall-seekers could then “unlock” the PSL at their local Starbucks a week before it was officially released to the public. 2) What’s so great about all this? Well, let’s take a closer look at the numbers. Starbucks started tweeting from @theRealPSL on August 4th, and as of this writing PSL has almost 87,000 followers and over 8,000 tweets. That’s some pretty amazing growth for just under a month. Starbucks, obviously, understands that there’s practically a cult following for this specific drink. They also know who buys the PSL, what social platforms they use (twitter, tumblr, and pinterest anyone? ), and what gets them to engage on those platforms. This whole campaign was a well calculated plan to capitalize on the popularity of the product, and ultimately, drive sales. 3) How does it apply to anyone besides Starbucks? I get that Starbucks has a HUGE budget to execute all of this. I’m sure they have more than one community manager devoted to the PSL twitter account, to say nothing of their other social networks devoted to the fall favorite. BUT THERE IS HOPE! What all this proves is that with a little research and a dash of creativity you too can create a hype machine! Before you start – assuming you’re hoping for this kind of hype, as well as a way to measure how it paid off – the first step is figure out who you’re going to talk to. Start with the data. If you don’t have data, start gathering some. Conduct surveys and informal polls; mine your e-news lists, google analytics and social media insights to find out who your customer is. Once you’ve figured out who they are, it’s time to figure out where they are. Check out those demographics again, better yet – ask them where they are! Survey Monkey has a great free survey plan that makes it a cinch to send a survey to your email lists. Now you know who they are, and where they are. Time to come up with a contest! Contests are tried and true methods of driving engagement on social, but they usually turn out to be pretty shallow. People come for the freebie, but leave after they don’t win, or the fun is over (more on that later). What was so lovely and different about this campaign was that everyone could be a winner. There was no limit to how many people could win the “prize” because the prize was early access to a product they still had to pay for. So, when you’re coming up with a contest and prize think about ways to offer value that a) don’t cost you anything, or very little and b) mean something to your base. While Starbucks was pushing something they already knew was popular, they found a way to offer value to the customer without costing themselves anything in profit. Granted, if you’re starting from scratch on a product, event, or service that isn’t already popular with your base, this can certainly be a little more tricky. BUT the same rules apply. Your prize will just require a little more research. After it’s over – Even if your contest doesn’t meet the goal you had hoped it would, it’s still worth taking a look at what worked and what didn’t once it’s all over. Why didn’t you meet your goal? Was the prize not as engaging as you thought it would be? Was the work the audience had to do unequal to the prize? What made people flock to that social site? Was it the push you did on other platforms? Was the e-blast the MVP? Make sure to take a look at the campaign as a whole, and don’t just focus on the narrow goal that was met or unmet. Did you gain something else from the process? Maybe some new followers even? I mentioned above that contests can be a really shallow way of gaining followers, but that’s only if you don’t keep up with them after the contest. If you keep offering value, as in content they find interesting, you’re more likely to keep those numbers you worked so hard for. Mashable has a pretty good article about running a successful contest, and Inbox Group has some good tips on how to keep those newbies, but the short version is this – keep in touch. Meaningful conversation on social media is key. Don’t let your social profiles die after the contest ends, and just as importantly, don’t make it all about you either. Social media is about back and forth – which is the last great thing about this PSL campaign. You’ll notice on their twitter feed that PSL responded to ALL of the contest-related tweets, and many that weren’t strictly contest-related. Making your social followers feel like they are being heard, and valued as customers, is one thing that Starbucks just knocked.out.of.the.park. on this one. Also – I can’t repeat the word value enough here…it’s a BFD, ok? @allyssaajusteen it's good to be back, bb! @Jarism Can you imagine going through middle school with the name SLAPPL? It would've been awkward. The last thing I want to say about this campaign, and contests in general, is this: do what you can do. Starbucks is a multi-billion dollar company. If you’re a small business, or a non-profit with a shoe-string budget – don’t freak out! Think about what your supporters like about you, think about the amount of time and money you can put toward a project like this, and go from there. Measure, measure, measure your first contest, and grow from there. You can do it!